I arrived at Kaieteur after spending nearly two years living in a small Amerindian Village in the interior of Guyana. 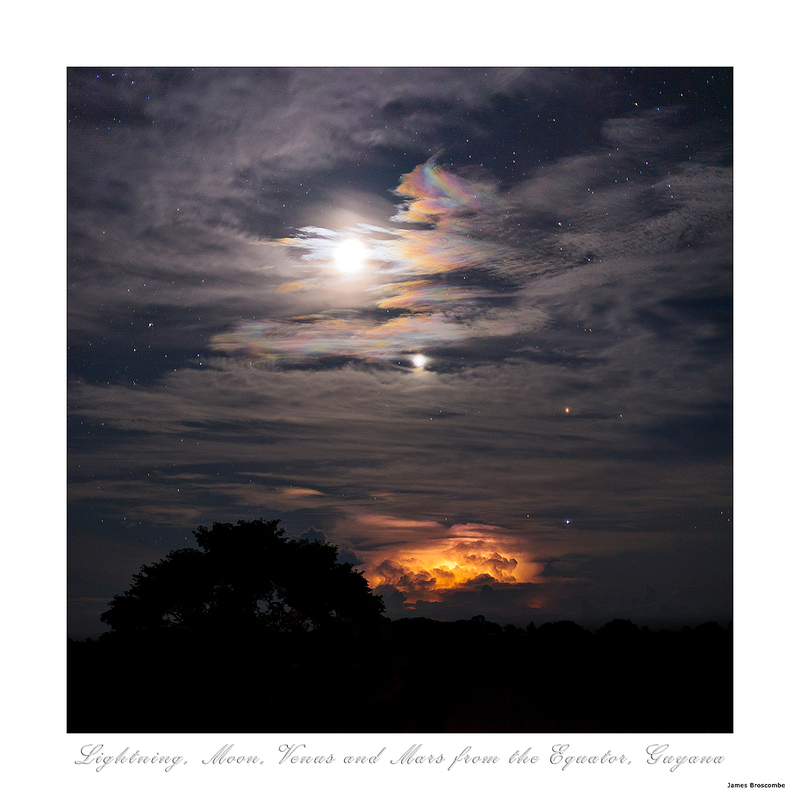 Being there for two full rainy seasons, when travel is almost impossible, I’d got quite used to lightning and had managed to get some practice photographing it. I had three nights at Kaieteur and I was hoping to get a photograph of the falls at night with stars behind. I had in mind a star trail photograph. I’d seen a few photographs of Kaieteur in Guyana tourist brochures – the obligatory shot from the plane, and the view from above the falls, and I wanted to achieve something different. I’m sure everybody who visits Kaieteur remembers their first sight of the falls. My initial thoughts were that I couldn’t do justice to the scale of the sight by taking a photograph. I probably sat for around an hour, staring at the water falling down whilst thinking that it wasn’t really worth getting my camera out. After a while I took a panorama of the falls and the valley below. A storm was running up the valley, with a few flashes of lightning, but the lightning stopped when the storm was still about 30 miles away (see my home page image). The first night, I discovered something interesting. The water in the river, heated by the sun during the day, holds onto its heat longer than the air around the falls. As soon as the sun sets the air starts cooling, but the water doesn’t. As it tumbles over the falls and crashes into the rocks below it gains a little more heat and then, as it is smashed against the rocks, the water evaporates and becomes a warm mist. The mist slowly builds and rises in the cooling air and the entire area becomes swamped in a thick fog. My plan for a photograph of the stars behind the falls was ruined. The next day I explored the different viewpoints around the falls. 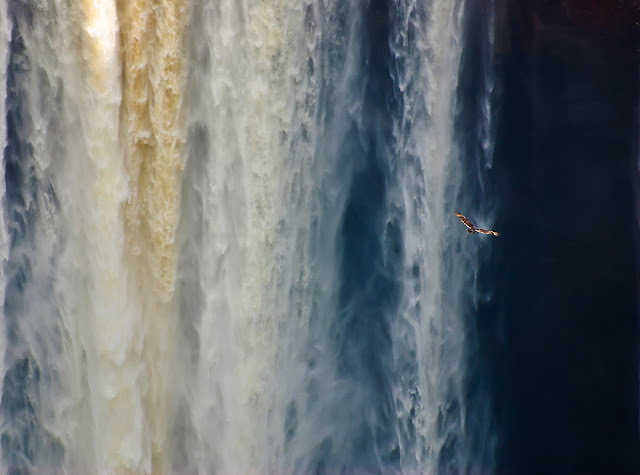 I managed to get my different view of the falls when I spotted a hawk flying in front of the curtain of water – I would have preferred a Harpy Eagle, and it would have been nice for it to be flying a little closer, but I was fairly pleased with it. The night I got the lightning strike shot I was lucky. The lightning came up the valley again, but it was later, right after sunset. The mist had started building in the bottom of the valley, but mostly it hadn’t reached more than halfway up the falls (although a small wisp can be seen in the photo). I set up my D700 on a tripod and using a 20mm lens framed the falls to the right of the picture. The lightning was all to the left of the picture, but it was moving to the right and I hoped that I would get a strike in the centre of the frame. Lightning photography really comes under the category of flash photography. It’s a big flash which you don’t control when and where it goes off, but the results are the same. In any flash photography you can’t really control the speed of the flash. It is very, very fast. Your only control over the exposure given to the light coming from the flash is through aperture and ISO settings. In this shot I would have the (lightning) flash in the picture. 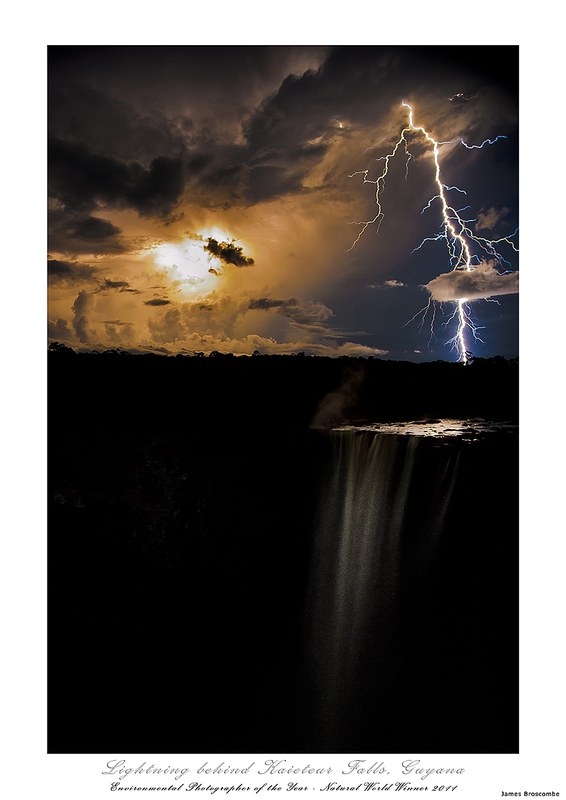 The lightning would also be used to provide light to the water in the river above the falls – either directly if the flash was behind the river, or from reflection off the clouds if the flash was where I expected it to be – more to the middle of the picture. I chose f/5.6 and ISO 640 for this occasion. There was a little bit of light coming through the clouds behind me from very weak moonlight. It wasn’t enough to cast a shadow and wouldn’t have been enough to stop me falling over the edge of the viewing point if I didn’t have my torch with me (there are no guardrails at Kaieteur – it is truly unspoilt)! A few test shots confirmed that a speed setting of 30 seconds was giving just enough exposure on the falling water. In hindsight a little longer would have been better – but 30 seconds is easy to set, whereas 40 seconds is a real pain! With the camera on the tripod and all settings locked in on manual I just had to sit there and press the shutter every 30 seconds, waiting for the lightning to move into the right place. There was a strike every few minutes, and at one point I feared it was moving behind me – with my camera on a metal tripod on the highest point around I was a bit of a sitting target! Most of the strikes were to the left and out of the picture, but they were moving closer. Finally after about 45 minutes there was a strike that really surprised me. It started as a ball of lightning nearly in the centre of the picture and the forked lightning came down almost to the left of the waterfall. It was very nearly out of frame, and in a completely different place from the previous strikes. I checked I’d caught it, and then continued clicking away waiting for another strike, but that was the last one, and the storm rolled away towards the distant Pakaraima Mountains. I rotated the image a little. Setting up the photo I could see virtually nothing through the viewfinder, not even the horizon. I adjusted White Balance. Digital cameras are pretty good at working out White Balance. Most things I set myself on manual, but with WB I leave the camera to worry about it. Part of the reason is because the camera often gets it right, but secondly, it’s so easy to reset afterwards that it’s not worth worrying about (unless you are using flash with gels). Of course, in this case the camera had pure darkness to look at whilst trying to work out what WB to use, so it set an odd value around 4800k which made everything look a bit purple. I reset it to 5793k, a custom level near daylight, in Lightroom. I increased Colour Saturation. By 3%, which is a habit I have with most of my photographs. This is linked to the JPEG conversion setting. I used a Camera Standard setting, rather than Camera Landscape or Camera Vivid. With the colours in the lightning, the Vivid or Landscape settings would be too garish. The Standard setting gives more subdued colours. I also desaturated the blue channel a little. And that’s all. A few small dust specs are cleaned out and the smaller versions of the picture are sharpened to be crisp on screen. Not a great advert for Photoshop! Meanwhile – I’ve since worked out how to take the shot of the falls with clear sky and stars behind… If anyone wants to sponsor me the price of a flight back out to Guyana I’m confident I can do it this time! Beautiful! You have managed to take a unique shot of Kaieteur Falls. Any Guyanese will attest to that. I love it. Love you photograph of lightening and techniques you used. Please view painting I have of lightening I have on my blog folk incognito. Fantastic! Finally a visually fresh… and arresting view of the familiar (to Guyanese) image of Kaieteur Falls. The other photographs seen here are pretty good too. Congratulations. And thank you. Awesome!What a gift from God’s wonderful display of work. I would say you were indeed bless to witness this beautiful display. Thanks for sharing.Keep the good work up. waterfall.I also have books from the earlier explorer. Barrington Brown.Many antiques of this beautiful County. This is amazing! The wonders of this world if only we can take a minute to check it out, we will find out what we are missing. Love your photopraphys. Thanks for sharing this, I know I will share this with my co-worker. Some thing that will stick in my mind for a long time. a beautiful photograph never seen in my life. what an unusual and picturesque view. You may want to do something about The Daily Mail (UK) claims that this picture was taken by Robert Harding (http://www.dailymail.co.uk/news/article-2184006/Kaieteur-waterfall-Moment-lightning-bolt-shoots-straight-cloud-breathtaking-waterfall.html).